A year ago, this pioneer aircraft of Malaysia Airlines A380-800 fleet (with tail no. of 9M-MNA) took off from Airbus Delivery Centre in Blagnac-Toulouse on a historic journey to her permanent home in KLIA. 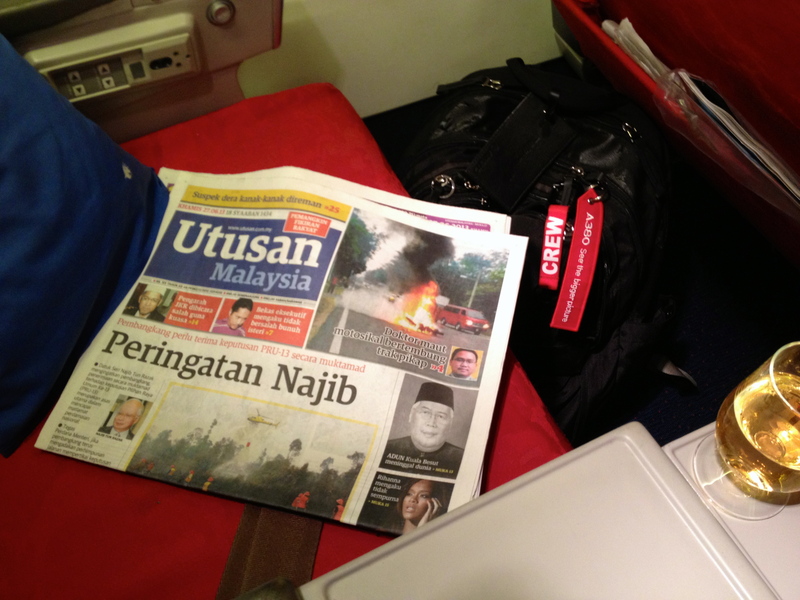 Twelve hours later, the aircraft carrying eighty passengers arrived in KLIA. It was received then by Transport Minister Dato’ Seri Chan Kong Choy. Two days later, the same aircraft made its inaugural commercial service to London Heathrow. Deputy Prime Minister Tan Sri Muhyiddin Mohd. Yassin send off the aircraft with the full complement of 494 passengers. The flight also commemorated Malaysia Airline’s 38 years of service to LHR. Today, all six A380s have been delivered by Airbus and now in daily service of Malaysia Airlines routes to London Heathrow, Paris Charles De Gaulle and Chap Lek Kok in Hong Kong. They are the pride of the national carrier. That is the infamous proverb. Persons in the inner circle of the powers that may be must not only be clean but be seen to be clean. That is what a special committee of Delivery Task Force (DTF) Anti-Corruption NKRA has decided to have for all aides to the Prime Minister, Deputy Prime Minister and Ministers. KUALA LUMPUR: ALL special officers to cabinet members will be required to undergo a vetting process with the Malaysian Anti-Corruption Commission and the police to ensure good governance and increased transparency. In a statement, Minister in the Prime Minister’s Department Datuk Paul Low said this was among the matters discussed during a Delivery Task Force (DTF) Anti-Corruption NKRA (National Key Result Areas) meeting yesterday. The meeting was chaired by Deputy Prime Minister Tan Sri Muhyiddin Yassin. “The role of a special officer is an important one in some cases as he or she acts as a gatekeeper to the minister, and is privy to highly-confidential information. “In order to ensure good governance and increased transparency, it was agreed during the meeting that all special officers to cabinet ministers will be required to undergo a vetting process with the MACC and police. “It will also be a requirement for special officers to declare their assets annually to the prime minister, their respective ministers and MACC chief commissioner. “By putting all these measures in place, opportunities for misconduct will be minimised,” Low said. The meeting was also attended by Minister in the Prime Minister’s Department Datuk Seri Idris Jala, Chief Secretary to the Government Tan Sri Dr Ali Hamsa and MACC Chief Commissioner Tan Sri Abu Kassim Mohamad. Another important decision made by DTF was the approval for the appointment of International Advisory Board members to MACC. Board members would be tasked to provide advice and review the NKRA initiatives specifically for MACC’s transformation, Low said. Members of the board would include high-profile individuals from the Hong Kong and New South Wales Independent Commission Against Corruption. “The intention of the board is to benchmark MACC’s performance to be on a par with international best practices and to improve international perception towards MACC. DTF is a governance structure implemented under the Government Transformation Programme in order to ensure proper monitoring and execution of initiatives. No longer the incidence where two Political Secretaries of a Cabinet Minister were arrested independent of each other for separate corruption charges and later be charged in a criminal court. Nor rumours about Special Officers of the Prime Minister building a million Ringgit home. The decisions they transmit of behalf of their bosses also should be verified if they are of advantage to some ‘interested parties’ or personal beneficiaries. Do not give anyone any reason to doubt the transparency and integrity of the current administration. That is something so easily rumoured everywhere, at any time. They should focus on their work instead ‘fire-fighting’ rumours. Special officer to MB Selangor Mohd. Yahya Mat Sari is sentenced to two years in the gaol and two strokes of whipping for committing an act of corruption bare;y three months into the Opposition Pact’s rule of the wealthiest state five years ago. SHAH ALAM: The High Court sentenced Mohd Yahya Mat Sahri, former special officer to Selangor Mentri Besar Tan Sri Abdul Khalid Ibrahim, to two years in prison and two strokes of the whip for cheating the president of Kumpulan Darul Ehsan Bhd, Datuk Abdul Karim Munisar five years ago. Mohd Yahya, 44, was charged with deceiving Abdul Karim into believing that the Pakatan Rakyat secretariat was seeking sponsors for the party’s 100th day celebration. Judge Datuk Abdul Alim Abdullah meted out the sentence after allowing the prosecution’s appeal against the Sessions Court’s verdict which acquitted and discharged Mohd Yahya, 46, of the charge in May 2011. The judge however allowed a stay of execution pending Mohd Yahya’s appeal at the Court of Appeal and set bail at RM15,000 with one surety. On May 20 2011, Sessions Court judge Azhaniz Teh Azman Teh had acquitted and discharged Mohd Yahya on the basis that the prosecution had failed to prove their case beyond a reasonable doubt. Mohd Yahya faced a further charge of inducing Abdul Karim to hand over RM50,000 in sponsorship for the event at the Gardenia Coffee House, Quality Hotel, on June 4, 2008. 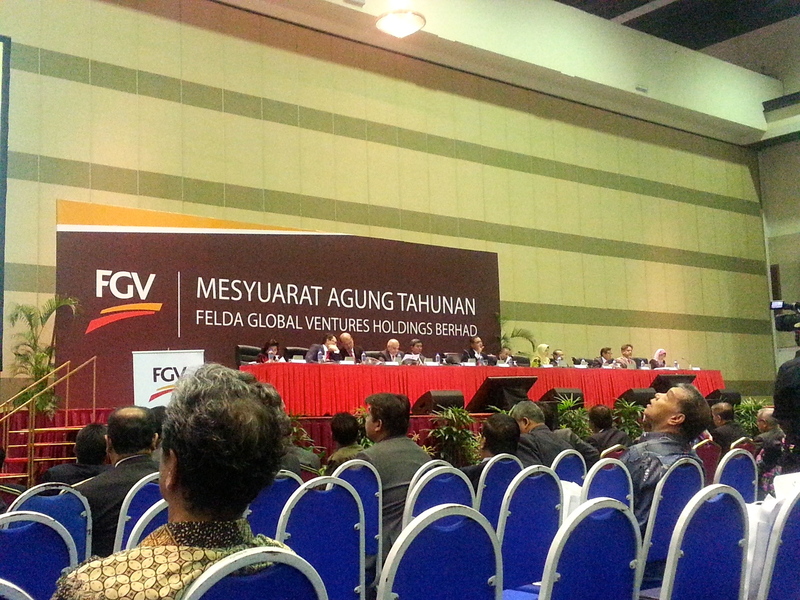 FELDA Global Ventures Holdings (FGV) Bhd held their AGM this morning. Several prickly issues raised in the bloggosphere for public consumption were brought up against the Board for clarification. It must be noted that FGV Chairman Tan Sri Isa Samad performed brilliantly, doing what the fictitious British civil servant Sir Humphrey Appleby do best; addressing to questions and queries without giving an actual answer and explanation. 1. Pradeeb Kumar n.k.a. Emir Mavani doubtful Ph.D in ‘Government Reforms’ from Warnborough University. 2. The discount given on the 50,000 tons sale of RBD Palm Olein to pig rearing company of Kunming, China Yunnan Huijia Co. Ltd.
3. The acquisition of 11,500 hectares of land in Papua New Guinea at exorbitant prices. In summing things simply, Isa Tai-Chi-ed all these prickly questions in defense of Mavani. On the unaccredited Ph.D, Isa said “When he did this course, he was working overseas and didn’t know that one day he will work in Malaysia, to face if there would be questions raised”. On the sale to Yunnan Huijia, “We sell oil to anyone”. However, he conveniently avoided to explain on the USD 20 per ton discount given. On the acquisition of the plantation and lopsided deal that is not beneficial to FGV, Isa coyly said “We will investigate whether or not is is done in accordance to the procedures set”. This is a very serious matter as one of the Invest Committee member volunteered to act the middle person on the deal. What Isa said basically implying that it is alright to earn unaccredited qualifications, especially when one is abroad even though one day one eventually would want to come back and work here. It is no mystery why Isa had to be defensive about Mavani; it was his own choice of ‘approved board member’ to be featured to replace FGV Group CEO Tan Sri Sabri. Isa had personal quest to oust Sabri from FGV late last year. What is baffling is that Isa’s poor attempt treating shareholders as if they are ignorant of these irregularities within FGV, considering that FGV is now a public listed MNC. All of that Humprhrey Appleby drama was done infront of 3,000 shareholders assembled in PWTC this morning. The AGM this morning is not reflective of the ‘Transformation Agenda’ that FGV is supposed to be heading. Especially not how Isa as the Chairman handled it, when his own choice of ‘transformer CEO’ is plagued with so many allegations of dubious deals. The controversies of the ‘doubtful Ph.D from Warnborough University’ and ‘Yunnan Huijia deal’ still very much the talk of town whenever the subject of FGV is brought up in any Klang Valleyite conversations. Now, it seems there is a new scandal if not unscrupulous acts of executive decision. It was brought to our attention the designated incoming CEO Pradeeb Kumar n.k.a. Emir Mavani and his able assistants imported from PEMANDU probably have been extremely busy pushing if not ‘forcing’ their Papua New Guinea proposal through the investment committee and the BOD of FGV. Strong rumours lurk within the industry that they have unilaterally resolved ahead of all other upstream plantation investments, FGV should value the PNG proposal at USD 110 million and acquire 70% of it from its vendors. It is also believed that they also have keen support from an Investment Committee member who happily volunteered himself to negotiate on behalf of the company and management. Nevermind that the said committee member is breaching all norms of corporate governance by accepting to negotiate on behalf of the company and then participating in the investment committee process to evaluate the merits of the investment. The “Thirteen Million Plus Ringgit questions” are why in Papua New Guinea and most of all, agreeing at that said price. The simplified answer it is because it’s value for money. However, it is not advantageous towards FGV but to the vendors. Also definitely to individuals with vested interest and would make personal gains from the deal. It is very clear why it is value for money for some personalities with vested interest worked very hard to push for the deal through, in so short of time. For one, 11,500 hectares of unplanted afore mentioned land is in the boondocks of a remote island called New Britain. It is valued and offered to be sold to FGV for the bargain sum of RM 9,600 per hectare. On its own, that could be considered a value for money acquisition. However considering a Malaysian plantations plc Kuala Lumpur Kepong Bhd (KLK) bought their land in PNG last year and it cost them a lot less, at only RM 1,500 per hectare. Probably some cheeky odd fellows could argue that KLK’s land wasn’t any good. That would rationalise why KLK paid too little. Then again USD 35 million for only 11,500 hectares of unplanted land is definitely a good value. Then there is also the beautiful virgin jungle around the area which the company can later plant with Oil Palm. So much potential. No need to worry about the NGOs in Papua New Guinea. People everywhere is this age wants development. Then again after they log and extract the timber, they can plant oil palm and make it productive. The next interesting question is that, FGV is into oil palm plantations. So, FGV needs to de-forest and clear the virgin equator thick jungle before they could prepare the land for estate plantation. FGV is in great luck because the vendors will do that. Nevermind they would make money from it. It could be argued that the vendors are doing FGV a favour. Nevermind that is actually to perpetuate their logging concession licence the Vendors are required by the terms of their land deed to plant oil palm. Also, it’s already partially planted. More or less 4,200 hectares are already planted. That planted area has also been valued by Crowe Horwarth (appointed by Pradeep Kumar n.k.a. Emir Mavani and the PEMANDUettes) for USD 75 million. That is only USD 18,000 per hectare or RM 55,000 per hectare for a 3.5 years old plantation of oil palm. As for comparison, JCorp subsidiary Kulim Bhd’s plantation in New Britain must be valued more than that. For the record, Kulim’s acquisition was between USD 1,000-1,200 per hectare and transacated slight overly a year ago. Nevermind there is no mill, FGV can spend the USD 30 million to build that necessary facility. In sundry, Malaysian Anti Corruption Commission should serious look into all these alleged due processes and decisions made and acts of executive decision within FGV and get cracking. All aggregated, for the tidy sum of USD 110 million. This is the new major activity M & A that FGV can look forward to under Pradeep Kumar n.k.a. Emir Mavani. That Ph.D in ‘Government Reforms’ from Warnborough University must have been worth it. The smartest person in the world couple with the PEMANDUettes will be running FGV. Interesting enough, in a small event yesterday at FGV Emir Mavani politely asked outgoing FGV Group CEO Tan Sri Sabri Ahmad as ‘Dr.’. Probably now he would want to be called ‘Captain’. 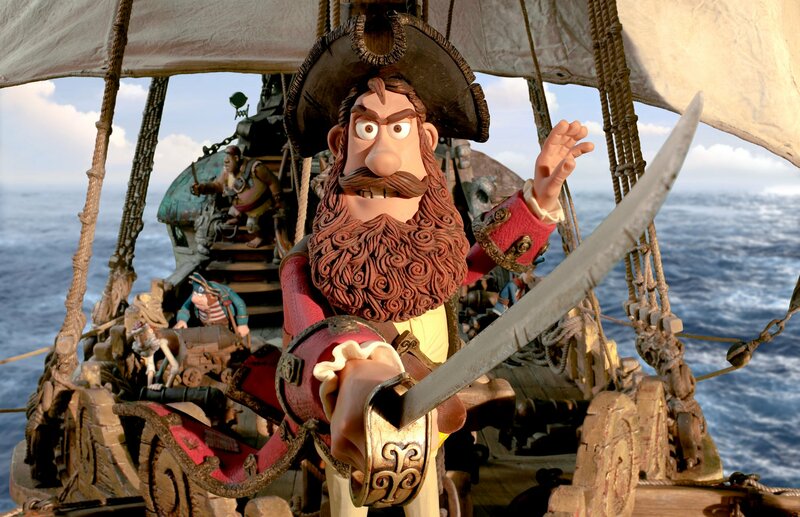 Just like Jack Sparrow or Black Beard. For the benefit of the stiff readers and humor bone deficcient, the MACC officers need not to investigate for secret desire to be called ‘Captain’. 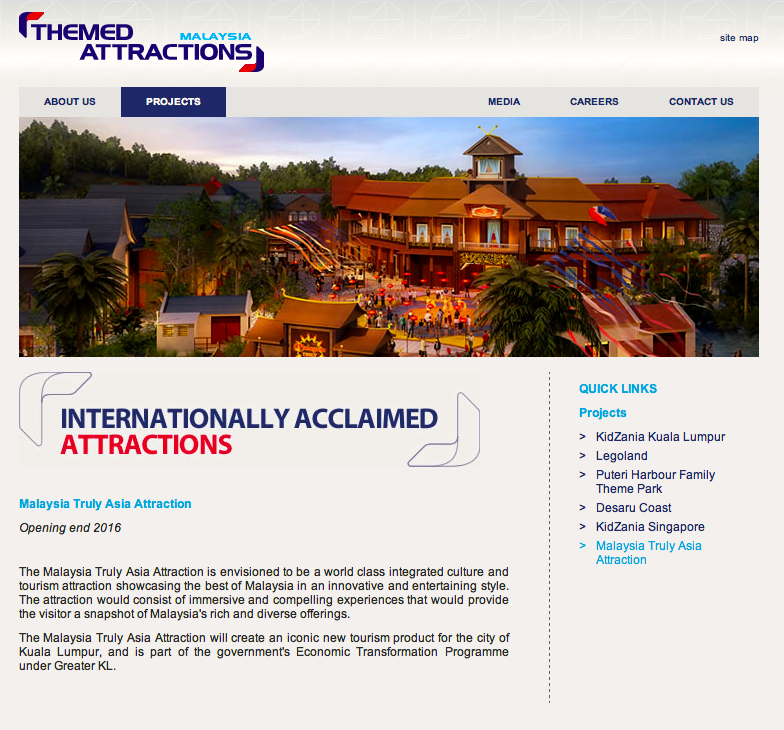 The Malaysia Truly Asia attraction by Theme Attraction and Resorts Sdn. Bhd. The snapshot of the grand plan of building Malaysia Truly Asia attraction in a 26.3 hectare site adjacent to Tugu Negara isn’t damaging enough taken at face value. There is an underlying sinister agenda. Malaysia Truly Asia Centre – an integrated cultural tourism park. It is a 65.66 acre site bordered by the Tugu Peringatan, Padang Merbok, Bank Negara’s Lanai Kijang residential complex and Istana Selangor and will be announced later in the year. Part of building that would be torn down and make way for this is the mansion where Institute of Strategic and International Studies is housed. It is believed it was the same building that Allahyarham Tan Sri Mohamad Noah Omar resided when he served as the first Speaker of Dewan Rakyat. The personalities appointed into the BOD and serving behind Khazanah Nasional Bhd.’s subsidiary Theme Attraction and Resorts Sdn. Bhd. (TAR) are reflective of the sinister agenda to follow through proposals in the lame excuse of progress and commercialisation. More importantly, to over-write over on history and possibly at the expense of heritage and traditional whilst at it. The Chairman is was former Minister in-charge of EPU in PM ‘Flip-Flop’ Abdullah Ahmad Badawi’s administration Tan Sri Amirsham A. Aziz. His contribution is remembered best when over night in mid 2008, the Federal Government rose the retail price of petrol by 78sen. It has already proven that Amirsham is a sort of leader who makes decision based on the facts presented and more importantly independent from political and community sensitivities. The other board members include ‘Level Four Boys’ operative Ganen Sarvananthan and former McKinsey consultant Tunku Besar Seri Menanti Tunku Ali Redhauddin Tuanku Mukhriz. Ganen is believed to be one of the architects behind the KFC restructuring plan late last year. It is no mystery why TAR is willing to go ahead with the project for maximising the full potential from the commercialisation of the 66 acre site. And in the process of monetising the asset, a sense of heritage, tradition and wealth of history is wiped out. Even though the proposal has not been approved by relevant authorities, the thought of coming up with the concept of taking away heritage and history and make way for commercialized projects is reflective of the thought process of the stewards of the company which is centered towards greed. TAR’s current projects in Johor such as Legoland in Iskandar Malaysia and Hello Kitty in Puteri Harbour have shown termendous success. In fact, Legoland is expected to rake it profits in their first year of operations. With the addition of Kidzania in Puteri Harbour, they are expecting an aggregated figure of three million annual visitors to all three theme parks. TAR did value add in new development areas such as Iskandar Malaysia and tapped some of the visitors from neighbouring Singapore. It is different from the proposed Malaysia Truly Asia attraction. Kuala Lumpur could do with an additional attraction as such, but not at the expense of dismantling its history and heritage. Definitely at the present proposed site, where part of it is a green lung for the city centre. If this thought process continues, probably one fine day some wise one within TAR would come up with the proposition to create a theme park attraction at the Old Istana Negara. And it should include all the mansions surrounding it, all the way bordering at the massive Chinese cemetery. That would be thinning of the wedge. 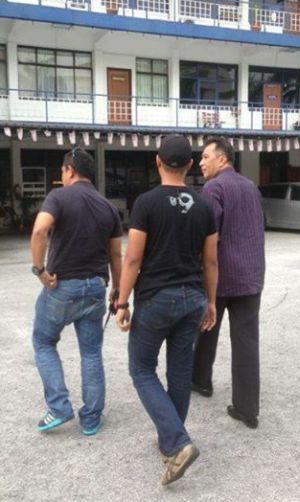 PAS Vice President Dato’ Husam Musa has just been arrested in Kampung Pandan and brought to Ampang IPD Police Station. It is believed he is being investigated under Section 4 (1) (b) of the Sedition Act (1948) and soon be sent to Kelantan, to facilitate and complete the investigation. PAS vice-president Husam Musa has been arrested today, possibly in connection to his claim that those who die at the Black 505 rally at Padang Merbok will be considered “martyrs”. In text message to Malaysiakini today, Husam confirmed that he is being investigated under Section 4 (1) (b) of the Sedition Act 1948 and is being held at the Ampang police station. One of his aide said that he was arrested at about 3.47pm. Other details are still sketchy. Over the past few days, Malay dailies Berita Harian and Utusan Malaysia had featured a series of reports condemning Husam’s “martyrdom” claim. Among those who were quoted was Kelantan mufti Mohamad Shukri Mohamad, who said that those opposing a legitimate government were traitors and not martyrs. Former PAS ulama committee member associate professor Mohd Nor Deris was quoted saying that Husam was not qualified to make such a “decree” and should be investigated. On Monday, Harakah had published an article quoting Husam urging youths to attend the rally. “If they sacrifice themselves, or some of us do, God willing, they will be syahid fi sabillah (martyrs),” he said. KOTA BHARU: Para pimpinan PAS menggesa seluruh ahli dan penyokongnya agar turun ke Kuala Lumpur 22 Jun ini bagi menyertai perhimpunan terakhir Black505. “Keputusan untuk menyertai himpunan ini bukan keputusan Husam Musa, bukan keputusan Haji Mohamad Sabu tetapi keputusan mesyuarat Jawatankuasa PAS Pusat untuk menyokong Blackout505,” kata Naib Presiden PAS Datuk Husam Musa (gambar). Sehubungan dengan itu, beliau menggesa semua para pemuda agar jangan ragu untuk menyertainya. “Andaikata kita terkorban, atau satu daripada kita terkorban, insya Allah ia adalah syahid fi sabillah,” tegas Husam Musa. Tetapi, kata Husam, tidaklah menjadi niat PAS untuk terkorban dalam perhimpunan ini. “Niat kita adalah penipuan pilihan raya mesti dihentikan dan sesiapa terlibat dengan penipuan ini mesti menerima tanggungjawabnya sekarang dalam sistem politik negara ini,” tegas Husam. “Kita boleh redha dengan kekalahan kita tetapi kita tidak diizinkan untuk redha dengan penipuan dan maksiat. “Ini dua perkara yang berbeza. Kita boleh terima hakikat takdir yang telah ditentukan tetapi kalau penipuan demi penipuan, tiap-tiap kali pilihan raya Umno menang hanya dengan penipuan, wajib kita orang Islam tegak berdiri menentangnya,” tegas beliau. Menurut Husam, semua pihak dalam Pakatan Rakyat tidak boleh berdiam diri dengan penipuan yang dilakukan dalam pilihan raya umum lalu. “Kalau kita berdiam diri kerana telah menang menguasai kerajaan (negeri), kita pengkhianat kepada perjuangan,” kata Husam. Sehubungan itu beliau bersyukur kerana semua hadir dalam pertemuann yang diadakan ini termasuk wakil kerajaan negeri Kelantan iaitu Datuk Ahmad Yakob. Beliau yakin undi yang diberikan oleh penyokong adalah untuk perjuangan bukan untuk mana-mana individu. Husam juga menjelas, tujuan diadakan himpunan Black505 adalah untuk mencegah kemungkaran sebagaimana yang diminta oleh Allah. Oleh itu, katanya, rakyat perlu bangkit menentangnya bagi memastikan penipuan tidak lagi berlaku dalam pilihan raya ke 14 dan 15 nanti. Dalam ucapan itu juga, Husam berkata, tidak mustahil Datuk Seri Najib Razak meletakkan jawatan dalam masa terdekat. “Kalau pengerusi SPR tak nak letak jawatan, Najib kena letak jawatan. Kalau kedua-dua letak jawatan, Alhamdulillah, itu lagi baik. “Atas sebab itu, tidak mustahil Najib letak jawatan,” tegas Husam. Bagi beliau, dalam PRU 13 yang penuh dengan penipuan itu, orang yang paling kecewa adalah Najib kerana dengan perbelanjaan yang begitu besar, dengan penipuan yang diatur begitu rapi, kenangkitan rakyat melalui peti undi lebih besar dari yang dijangkakan. “Kerana itu dia kecewa. Dalam politik moral, politik akhlak dan maruah, Datuk Seri Najib yang menang minoriti tidak layak untuk memimpin rakyat,” tegas beliau. Atas dasar itulah, katanya, himpunan Blackout505 akan diadakan di Kuala Lumpur 22 Jun ini bagi menuntut perubahan di negara ini. Husam needed to be a hero. He was said to be a rising star amongst the Young Turks and Anwaristas. Under that notion, PAS delegates elected him the Vice President. Then MB Kelantan dan PAS Spiritual Leader Nik Aziz Nik Mat also gave him the political patronage. Of course being an ambitious and brash leader, he rubbed many conservative Kelantan PAS leaders the wrong way. Hence, the old guards within PAS especially amongst the Ulama’ faction and Kelantanese wanted his political career curbed if not dead. So they fixed him to challenge UMNO Secretary General Tengku Dato’ Adnan Mansor in Putrajaya Parliamentary seat two months ago. In the falsehood belief of the Opposition able to take over the Federal Government, Husam was shredded into pieces. Nik Aziz was also ousted from Kelantan, after a gruesome 22 and a half years of preserving the state in timeless pristine non development position. Deputy MB assumed MB Kelantan post. Suddenly, Husam who won the DUN Salor seat saw himself without an Exco post, a job he used to ‘politically terrorised’ the PAS circle with. It is evidently clear he is without a chair after the music ended. Now Husam has to remain relevant, especially to the mad anarchists amongst the bigger Opposition supporters and those higher up in the echelon. He already lost the suit against NST earlier in the month. KUALA LUMPUR (June 11, 2013): PAS vice-president Datuk Husam Musa today lost his RM10 million defamation suit against the New Straits Times Press (M) Bhd (NSTP) and four others over an article in relation to his posts in the party and government. His counsel Zulqarnain Lukman told reporters that High Court Judicial Commissioner Lee Heng Cheong ruled in chambers that the article was not defamatory. Zulqarnain said Lee also held that if the article was defamatory, the court found that the defendants’ defence of qualified privilege and responsible journalism was applicable in the case. He said the court also found that Husam had failed to establish his case against the defendants and ordered him to pay RM20,000 in costs to the defendants. The court made the decision after hearing the testimony of three witnesses for Husam and two for the defendants. In 2010, Husam filed the suit against NSTP, its two reporters Shuhada Elis and Nik Imran Abdullah, former NST group editor Datuk Syed Nadzri Syed Harun and then NSTP group managing editor Datuk Zainul Arifin Mohammed Isa. In his statement of claim, Husam said the defendants had written and published with malice an article on Nov 23, 2009, over his posts to injure his reputation. He had sought RM10 million in damages, costs and other relief deemed fit by the court. The defendants, in their statement of defence, denied the words published were defamatory and said the article was published on an occasion of qualified privilege. Naturally, Husam got to gain attention to remain relevant. Especially when the ‘Black 505’ rallies are losing traction and dwindling support. Compared to the first one in Kelana Jaya days after the 13GE had just concluded where 55,000 turned up and the 25 May in Petaling Jaya where 25,000 people attended, today’s Padang Merbok amassed no more than 10,000 people. Then the Opposition clearly hoodwinked the rakyat with all the mumbo-jumbo of the so-called cheating during 13GE and “Rakyat being denied of true democracy and Parliament is not valid”, when Anwar Ibrahim’s recent announcement that they would eventually attend the Monday Parliamentary swearing in. The drama was already clear when PAS and DAP were the first Kelantan and Penang governments sworn in, respectively. Being a staunch Anwarista, Husam is capable to making fiery statements like “Dying like a martyr”. If the investigation is positive and Husam is charged under Sedition Act, then he is the second top PAS leaders who have been thrown the same book of laws at. The first is PAS Deputy President Mohamad Sabu. Conveniently, the both of them belong in the same Anwarista Young Turk faction within PAS. Typical of any Opposition leaders, Husam needed to remain relevant in the attention of their supporters especially to the young, anti establishment and rebellious ones by making outrageous statements. It is their sordid way to substantiate for their inability to bring progress to the rakyat. Bad enough that it was raised about the designated CEO to FELDA Global Ventures Holdings Bhd. Emir Mavani claimed to have obtained the doubtful Ph.D. in ‘Government Reforms’ from Warnborough University in the United Kingdom, in here barely three weeks ago. Now, it seems that there is what should be a scandalous deal when its out in the open. It was said that even before taking over officially as the CEO of FGVH, Mavani made the decision to sell RBD Palm Olein to some ‘non preferred’ customers. RBD Palm Olein is the liquid fraction obtained by the fractionation of palm oil after crystallization at controlled temperatures. It is especially suitable for frying and cooking. What is interesting about the buyer is Yunnan Huijia Import & Export Co. Ltd. of China. The company’s main stay of business operations in rearing and trading swine and pork meats and related products. The deal was for the sale of 50,000 metric tons of RBD Palm Olein. FELDA Marketing (FELMA) is the outfit to market CPO and processed oil. FELMA advised against the sale, considering the background of the buyer. More over, the sale of products to companies in China is usually at a lower price. Thus, any export to China would not be FELMA’s preferred choice. It was said Mavani went ahead with the sale despite FELMA’s opposition and instructed that a USD 20.00 per ton discount be given to Yunnan Huijia. The current market price of RBD Palm Olein is USD 790-800.00 per ton (Malaysian domestic market). It is believed on top of that discount, the commission USD 20.00 for every ton that was sold to Yunnan Huijia was personally pocketed by someone within FGV. That is a cool USD million for the RBD Palm Olein deal. Malaysian Anti Corruption Commission officers should investigate the sale of RBD Palm Olein to Yunnan Huijia and probably Mavani’s own accounts. FGV cannot be tarred if the CEO and senior management are involved in separate deals with their clients and suppliers. What is more damaging if there were personal gains made, through these deals. On another perspective Shareholders of FGV, especially those from the 112,635 FELDA settlers would likely want to know why are they selling products to swine producers at a discounted price. More over, subsidising export. 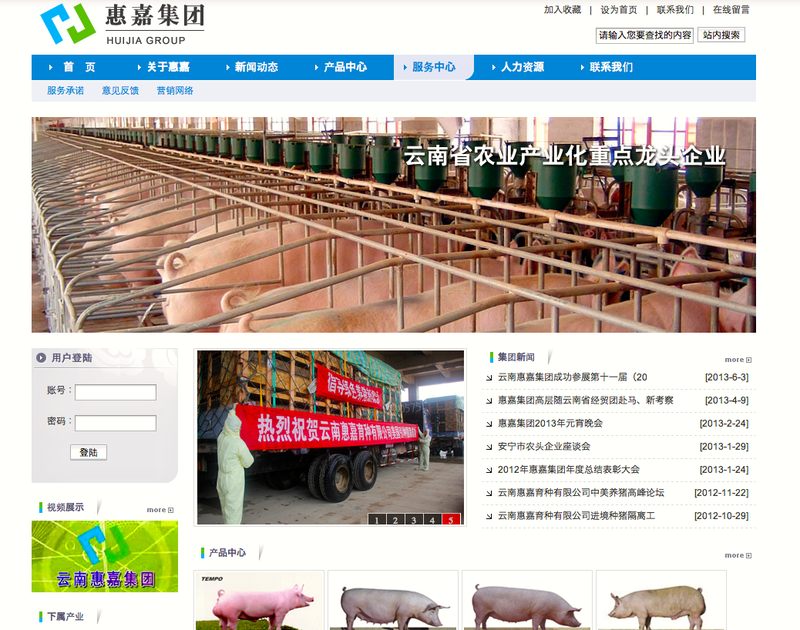 It would not be good for them to feel that their investment is technically subsidising porcine based business in China. Its is a serious matter of integrity. Especially FGV is the corporation that is entrusted to carry out business where the proceeds would be channeled to fund for the development programs for the 112,635 families of FELDA settlers and neighbouring communities. Mavani is supposed to take over from Tan Sri Sabri Ahmad in 25 days time. Mavani was PEMANDU’s nominated personality into the BOD of FGV. He was the director in charge of oil and gas in PEMANDU. It is believed that since it was raised in public domain, Prime Minister Dato’ Sri Mohd. Najib Tun Razak recently instructed the BOD of FGV to investigate the integrity of Mavani’s Ph.D. In the upcoming board meeting on Monday 24 June, Mavani is expected to produce his Ph.D, original trasncript and thesis for scrutiny and verification. Let’s hope that there is no unscrupulous practice of deception detected. There is too much at stake here. Strong rumours amongst capital market punters and observers that Former Minister in-Charge of EPU Tan Srì Nor Mohamed Yakcop would be appointed Chairman of Permodalan Nasional Bhd. (PNB), very soon. Nor Mohamed was dropped in the recent 13GE BN line up, but only to be given the ultra powerful Deputy Chairman and Chairman of Exco in Khazanah Holdings Bhd. That already caught so many by surprised considering that Nor Mohamed provided strong backing to the much dreaded ‘Level Four Boys’ during PM ‘Flip-Flop’ Abdullah Ahmad Badawi’s weak and scandalous administration. It is also believed that Nor Mohamed requested for it as part of his departure from Cabinet. This pattern re-appointment into another role is nothing new, as Prime Minister Dato’ Srì Mohd. Najib Tun Razak previously appointed has beens to Chairmanship of several Federal Government commissions and agencies. Tan Sri Syed Hamid Al-Bar was appointed to SPAD, failed KSN Tan Srì Sidek Hassan into Petronas and the more recent Dato’ Sri Ng Yen Yen into Tourism Malaysia. Nor Mohamed isn’t someone perceived with clean hands nor of high integrity. He was part of Abrar Corp when the company acquired Munloong Bhd., utilising funds that were not authorised for them to do such acquisition and corporate maneuvre. It is believed there was a CBT case on the corporate exercise. For the record, two of his former Political Secretaries were arrested and separately for corruption. The current Chairman of PNB Tun Ahmad Sarji Abdul Hamid, 75, who has been in the chair since 1996. Nor Mohamed saw the opportunity for the post to be replaced and seizing the moment. Especially Ahmad Sarji’s retirement from BOD Sime Darby last November. Nor Mohamed siting in the strategic post where all Federal Government investments and the largest pool of Bumiputera unit trust investments would be under his direct control. He would be the most powerful 65 years old multiple-retiree. Never before in the history of Malaysia that a former top echelon civil servant and Cabinet Minister has so much direct strategic and integrated operational control in so many conglomerates, corporations and associate companies. This include the largest bank Maybank and conglomerate Sime Darby, on top of all the infrastructure and essential service providers. Just to add some colour, Nor Mohamed was responsible to ‘cull’ all the hopes of the new Malay corporate giants in the likes of Tan Sri Tajudin Ramli, Tan Sri Halim Saad, Tan Sri Rashid Hussain, Tan Sri Wan Azmi Hamzah and Tan Sri Azman Hashim. Currently, there is a law suit by Halim on the fraud Nor Mohamed did to kill the onetime Malay infrastructure billionaire. A lot at stake here. The future of the all the GLC endorsed Bumiputera Commerce and Industrial Community programs and largest Bumiputera unit trust is under one single person. The whole integrated program is now sustainable to a lot of high risk exposures, including someone susceptible to graft practices. The business of government is really tricky. It is a very complex mixture and infusion of arts and science of administration, politics, management, economic planning, reporting and managing expectations. It is an enigma of many variances, running parallel. In the midst of dealing with the complexity of challenges, some politicians are bent of preserving their position and power, more than anything else. Where as the civil servants who are supposed to execute the operations of the government, are either confused on the inconsistent policies, directions and the whims and fancies of ministers whenever there is a Cabinet reshuffle. Or as experienced administrative professionals, they have their own interpretations. And they work against their political masters in their own ‘little kingdom’, supported by an elite group of trusted lieutenants. At times, it has been often wondered whether persons in these political and/or administrative positions suffer from the ‘moral vacuum’ syndrome. In sundry, concert or even in isolation. When it comes to a juncture that would lead into a conundrum or crisis, they have the ‘alternative avenue’ instead of doing the right thing. They might work in tandem to cover their own tracks. So they adopt The Rhodesia Solution’. “You write a note that is susceptible to misinterpretations”. In the end, issues are not addressed. Compounded enigma of problems are swept under the carpet. They have their on intelligent mannerism to explain their position, even manipulate figures and analysis. Especially now in the age of KPIs and NKRA. In short, they allowed for a ‘Systemic Failure’. And perpetrators go scot free. Its seems that Prime Minister Dato’ Sri Mohd. Najib Tun Razak’s lousy luck bout is digressing from bad to worse. Not only it has been established that BN’s lowered performance for 13GE is due to the ‘Systemic Failure’, it seems to be continuing post 13GE as the ‘Systemic Faliure’ train rolling on the track towards destruction for the Prime Minister. KUALA LUMPUR – Malaysia will not emulate Singapore’s move requiring blogs and news portals to be licensed, but will instead opt for self-regulatory measures that make it necessary for blog and website owners to reveal their identities, said Prime Minister Datuk Seri Najib Razak. “The government, for instance, will not move to license news portals, as what has been done in a neighbouring country. He said the country’s media and news organisation landscape had evolved tremendously, with print and electronic media being complemented by online media. Apparently, that was not what PM Najib delivered in his speech. Probably it was included in the text prepared by his office, but during the delivery he decided to skip the whole thing. What was important is what the Prime Minister said, not what was prepared for him to say. There is a serious systemic failure in this. One, who prepared the speech and was the bit about ‘bloggers and portal owners must reveal identity’ was something the Prime Minister wanted to tell at the MPI dinner? Or, it was someone in PMO’s conniving agenda to tighten the screw on bloggers and on line journalists, to emulate what Singapore did last week? 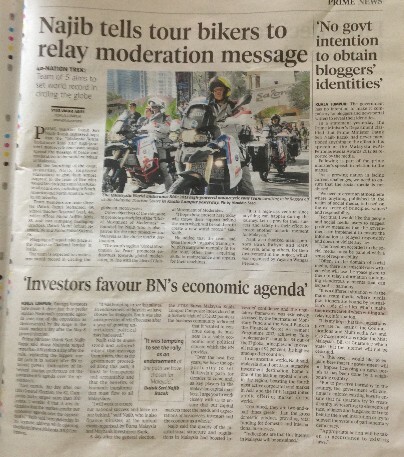 Then again, there is this bit about NST played this story. Was it an agenda or negligence? Datuk Rocky raised in his posting today that there is an agenda to put words in the Prime Minister’s mouth. It must be a sinister agenda because someone or a group of individuals within conspired, either the inner circle of the PMO or the editorial board of NST wanted to create a wedge and probably a war between the Prime Minister and bloggers and online journalists. If it was pure reporting negligence because the writer and editor did not check on the delivery before they send the story for production, then it demeans the awards the English daily won that night. It is utter shame that awards winner Farrah Naz Karim’s great work as a newdesk editor is marred considering the Group Managing Editor’s leadership incompetency even boo-booed the speech of the Prime Minister. For the record, PM Najib who picked the NST Group Managing Editor. 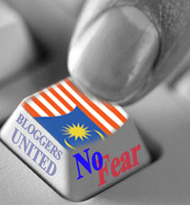 KUALA LUMPUR: The government has no intention to make it compulsory for bloggers and news portal writers to reveal their identities. 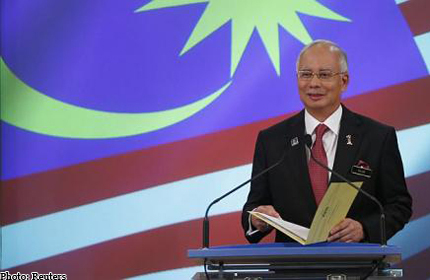 In a statement yesterday, the Prime Minister’s Department clarified that Prime Minister Datuk Seri Najib Razak had never mentioned anything to the effect in his speech at the Malaysia MPI-Petronas Media Awards 2012 as reported by the media. Following is part of the prime minister’s speech in relation to the matter. “As a growing nation in facing current challenges, we need to ensure that the social media is not abused. “We need to create an atmosphere where anything published in the realm of social media, is based on the existence of principles, values and responsibility. “For that, I would like the people and social media users to suggest positive measures that the government can implement to ensure the information is relayed responsibly and does not violate any law. “The freedom accorded to the social media must be parallel with a sense of responsibility. “Often, in the domain of social media, there are mischievous writers who will use the space given to them to relay information containing slanderous elements that can jeopardise harmony. “It is a different situation with the mainstream media where media practitioners are bound by journalism’s code of ethics which make them extra careful when writing and relaying information. “It is my hope that the suggestions given are not against the Communications and Multimedia Act and also those provisions under the MSC Malaysia’s Bill Of Guarantee which states that the Internet will not be censored. “In this case, I would like to explain here that the government will not impose licensing on news portals as has been done by a neighbouring country. “But to preserve harmony in the country, the government will continue to enforce existing laws to ensure that no quarters try to create disunity by resorting to elements of race, religion and language or try to belittle the royal institution or try to subvert the system of parliamentary democracy. Something is amiss here. The story is based on a statement issued by PMO. 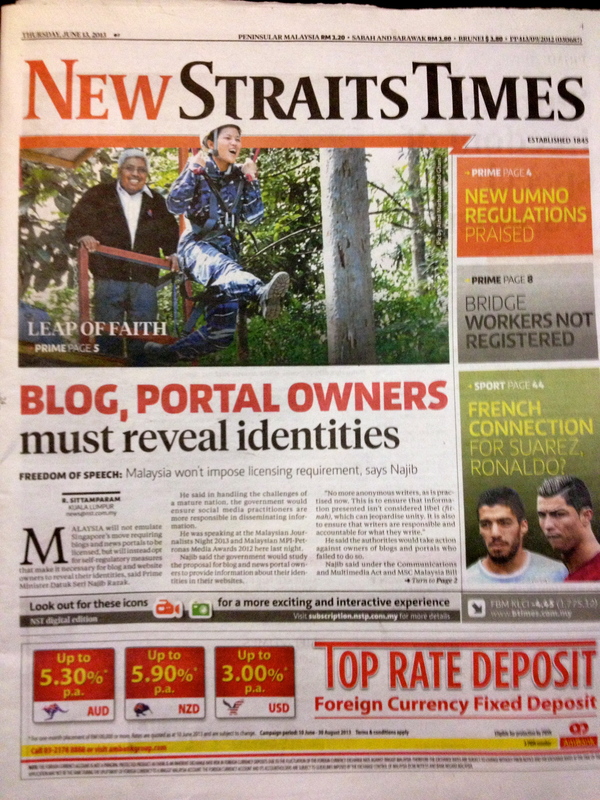 For the record, the NST front page story about bloggers and online journalists identity is no longer available in the NST portal. That is very much the proof that there was a conspiracy between individuals within PMO and some members of the NST editorial to fix the Prime Minister into a war with the bloggers and online journalists. The very least, that wedged a notch on the distrust block of the bloggers and online journalists with the Prime Minister. Probably Jalil Hamid shouldn’t be away abroad to often and get his act together. ‘Information infidelity’ by personalities that are supposed to work and deliver the best results is something Dato’ Sri Najib cannot afford to have either is his personal capacity or as the Prime Minister, especially now. A lot at stake, more now than ever.